Jiumenkou Pass lies 15km north of the Shanhaiguan Pass. I was built across the Jiujiang River, and had nine sluice gates for regulating the flow of the river, hence its name, meaning “nine gates”. The 125-meter-long wall across the river is called the “city bridge”. The pass was built on the riverbed by laying 7,000 sq. meters of granite slabs, which were linked together by U-shaped iron hoops. According to records, Jiumenkou was first built in 1381, and renovated n the Hongzhu reign period (1488-1505) of the Ming Dynasty. In 1626, a tower was built at each end of the “city bridge”. From the bridge southward to the foot of Laoniu Hill there are seven watchtowers built along the 800-meter-long supporting wall, and four watchtowers sit along the supporting wall in the north. 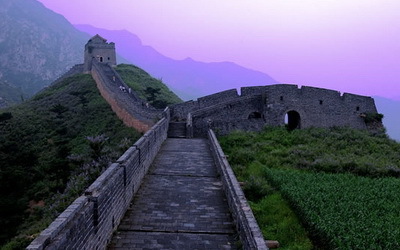 Outside the wall, a watchtower called Qingtai Tower lies on a hilltop. Its northern wall has six embrasures in two arrangements designed especially for shooting arrows, and the eastern wall has 11 embrasures in three rows. Inside the town was the Jiumenkou pass town composed of three small, interdependent towns, namely the eastern, western and northern towns. The government office was in the eastern town, the western town was where rations and forage were stored, the northern town was heavily guarded. On the top of the gate of the western town was a horizontal board bearing an inscription meaning “No.1 Pass East of Beijing”. The open ground across the river west of the pass town was a military drill ground. In the north are the Zimu (Mother-Son) Towers-two beacon towers built in a unique architectural style. In front of the primary beacon tower, which is higher and shaped like a cylinder, a secondary one was built in a semi-circular shape and functioned as a protective wall. Such an architectural style can be seen only here. The geographic location of Jiumenkou made it the only passageway to outflank Shanhaiguan Pass, and therefore it was often involved in battles which erupted at Shanhaiguan Pass. In 1644 li Zicheng directed 100,000 troops to attack Shanhaiguan Pass, while his subordinate Tang Tong led 20,000 men to attack Jiumenkou. Other battles in this area include the Second Zhili-Fengtian War in 1924 between the Zhili Clique and the Fengtian Clique of warlords, the KMT’s repulse of the Japanese attacks in 1933, the campaign in which the Eigth Route Army recovered Shanhaiguan Pass from the Japanese in August 1945, and the war unleashed in November 1945 by the KMT in an attempt to seize the Shanhaiguan Pass from the CPC-led People’s Liberation Army, just to name a few. he wall has weathered badly over the years, but its contours can still be clearly made out. The Jiukoushan area has towering mountains, steep and perilous cliffs and deep valleys. The walls spanned the mountainous terrains and hugged the area's numerous peaks and valleys. It is a classic example of the harmonious relationships of architecture and nature. In 1992, some repairs were carried out and the section was opened officially to tourism. In 2002, Jiumenkou Great Wall was listed as a World Cultural Heritage Site by UNESCO, the only such listed site in northeast China.